The mountain town best known for its hot springs and river rafting through Glenwood Canyon is also a model community for green environmental initiatives and sustainable practices. Glenwood Springs celebrates Earth Day year-round; the hot springs town is at the forefront of eco-planning with innovative ideas and projects that put the focus on conserving natural resources and improving the visitor experience. because of its commitment to planting and nourishing a healthy high-density amount of trees in its city-wide landscape. Tree City USA is a nationwide movement that promotes urban forestry management. The benefits of an abundance of trees in town include reducing energy consumption, taming stormwater runoff, fighting climate change and, providing natural beauty for inhabitants and visitors. which becomes operational on May 1, is another of Glenwood’s green initiatives. The popular hiking site and National Natural Landmark in Glenwood Canyon was in danger of being loved to death with over 130,000 visitors per year. The new permit system will allow the popular hiking trail to recover from overuse by reducing the number of daily visitors and providing funds for better management, maintenance and oversight. 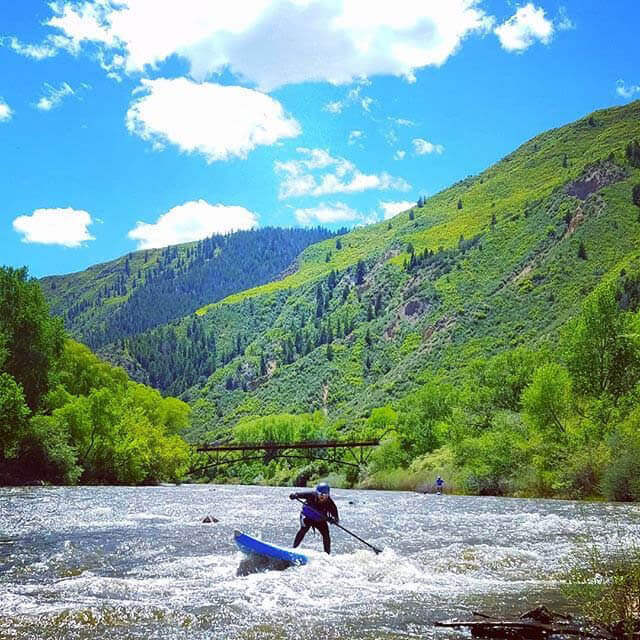 at Glenwood Springs parks not only benefits the riparian habitat, but improves the river recreation experience for everyone, including the favorite Glenwood pastimes of rafting and kayaking. At Veltus Park along the Roaring Fork River, new stone steps and shoreline accessibility also enable families to splash around and enjoy the water. Two Rivers Park, the location of Glenwood’s Summer of Music series and other events will soon be the newest target of Glenwood’s shoreline restoration efforts. Two major trails offer riders ample cycling mileage. The Rio Grande Trail is 42 miles long and connects towns all the way south to Aspen. The Glenwood Springs Recreation Trail offers 16 miles through scenic Glenwood Canyon. Additionally, Glenwood has added even more trail inter-connectivity with the 14th St. Bridge and the extension of paved biking trails along the Roaring Fork River, which parallels Midland Avenue in West Glenwood Springs. The town is also home to many mountain biking trails including the Grandstaff, Jeanne Golay trails on Red Mountain and the Wulfsohn trails in West Glenwood. Portions of the new South Canyon trail system are rideable now, with trail building work ongoing. While relaxation is the primary focus at Glenwood’s hot springs amenities, both Glenwood Hot Springs Resort and Iron Mountain Hot Springs harness geothermal energy to drastically reduce their energy consumption. Both properties are eco-conscious and use excess BTUs (British Thermal Units) to preheat water for showers and laundry, and to melt snow from roofs and pathways in winter. Glenwood Springs is unique in that it operates its own electric utility. Currently, 30 percent of the City’s electrical power is generated from renewable sources—wind, hydroelectric and solar. In 2019, the City will be increasing that to a full 100 percent! Make plans to visit Glenwood Springs, one of Colorado’s most green and sustainable towns.